Learn new (knitting) skills. The main skill I want to tackle this year is steeking. Improve on what you know (about knitting). I feel confident in a lot of my basic knitting skills, but I’ve noticed how much certain things have improved just by knitting more regularly and being conscious of them. For example, my tubular cast ons and cast offs tend to be a bit wonky and loose, but I have been consciously working to adjust the tension on my last couple of projects and have seen great improvements. Similarly for my fair isle work, I want to practice working with multiple colors and maintaining an even tension. 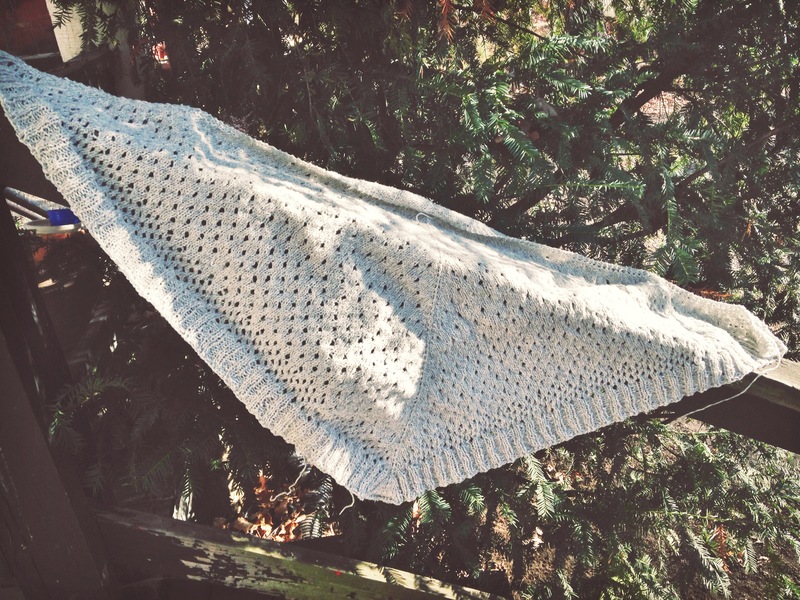 Publish a knitting pattern. I’ve had a very simple but very lovely hat on the needles for about a year now. It needs to be reknit because of gauge issues, and I need to do some research on decreasing in pattern. 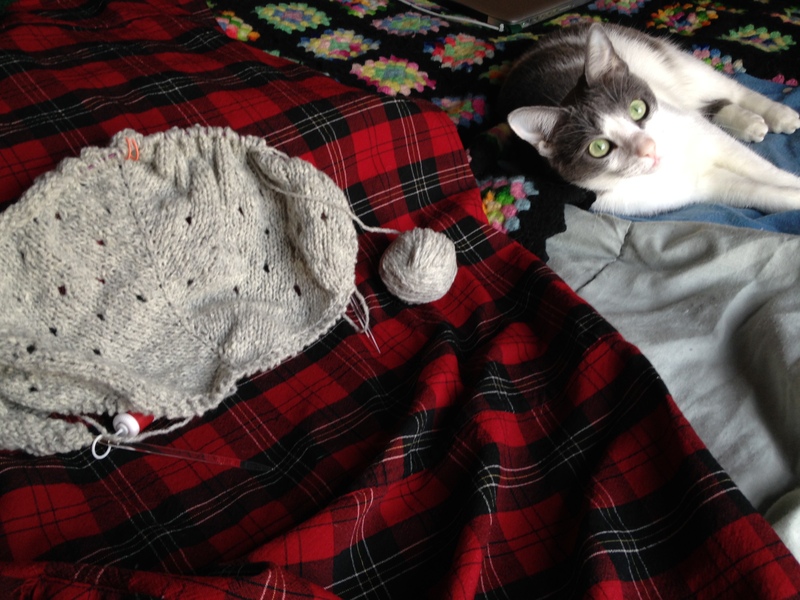 These two things have prevented me from finishing the project and beginning the process of writing up the pattern. It’s my goal this year to finish this hat and publish it on my blog as a free pattern. For those curious, it’s the Grecian Plait Tuque I talked about a while back. Return to this list throughout the year to reflect on. Some of these goals are general life goals and some of these are knitting-specific goals, but I want to be more mindful of goals throughout the year, without worrying about whether or not I’m meeting all of them perfectly. And that’s it! Maybe it’s a bit late for a goals post, but, really, my blog, my rules. I hope you’re all having a good January filled with yarn-y goodness! First post of 2015, hooray! 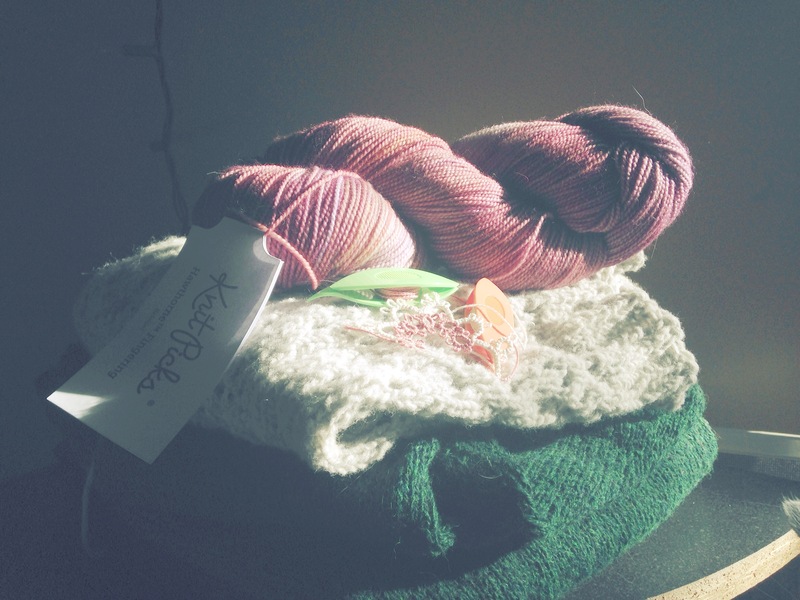 In terms of knitting, I am very excited for the new year. I set myself a lot of crazy goals for 2014, and met a few of them, but mostly I was unrealistic about my knitting speed and enthusiasm. 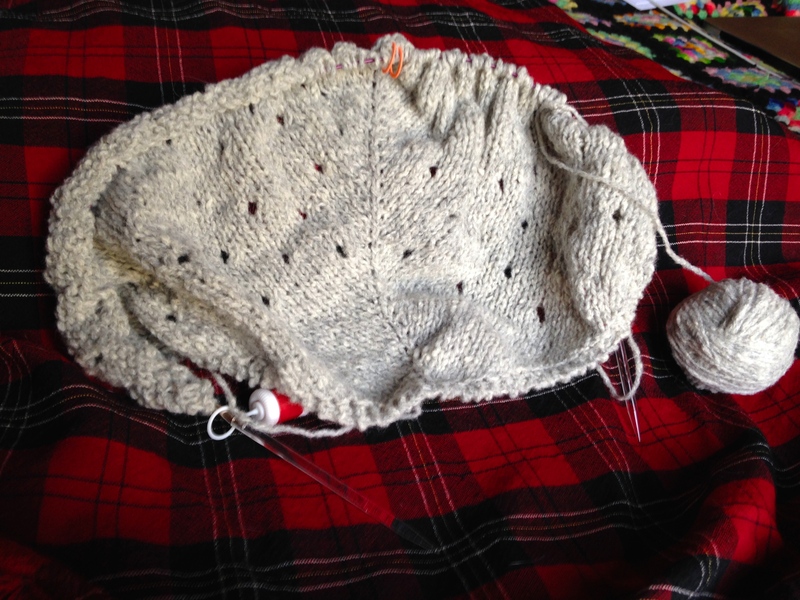 However, I feel like I’ve got my knitting mojo back, and I’m ready to get started on some challenging projects. I’ll do a little post about my goals for 2015 in the upcoming week. But for now, an update on what’s been happening since the holidays. 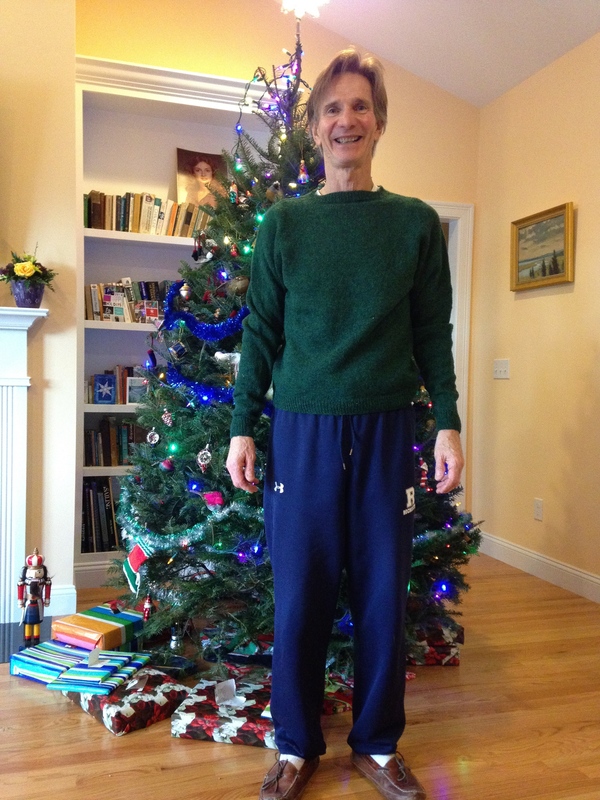 First, I gave my dad the long-awaited Birthday-Christmas-Birthday-Christmas Sweater (it took me a long time to finish). Annnnnnndddddd…it fit! It could be a little longer through the torso, and the arms could be a bit shorter, but it fits well enough to be worn, and I am very pleased. The top-down raglan sweater calculator I used was helpful and easy to mess with. Definitely a good place to start if you’re moderately comfortable with your knitting skills, but want to make a basic sweater. However, the symmetry at the front and back of the neck does make the fit around the front of the neck a little awkward. There’s a little bit of bucking right there that may or may not relax away with a bit of wear. 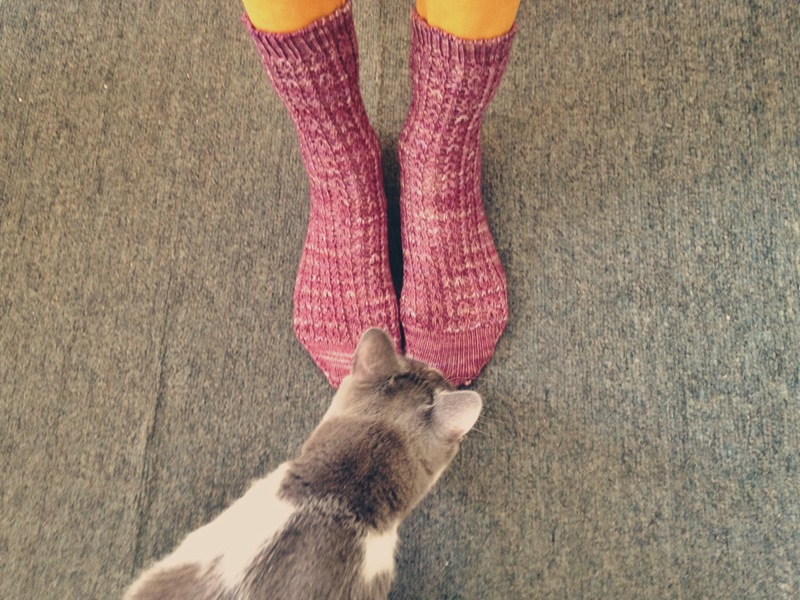 They’re the Froot Loop Socks from Knitty, in Knit Picks Hawthorne. They fit my feet, and the yarn seems very sturdy. If I were to knit them again, I’d use smaller needles on the ribbing (not sure why the pattern didn’t call for it), and my tubular cast-on was a bit loose. I’m always paranoid about making cuffs too tight. The froot loop pattern was really easy to learn, and I think it’s the perfect amount of texture with this variegated yarn. As always, full details on my Ravelry page! Up next is a pattern I’ve had my eye on for about six years now – the Anemoi Mittens by Eunny Jang. After knitting the Endpaper Mitts take two last year, I feel ready to get into some more serious colorwork. I think these will be the perfect next project – small, but somewhat challenging, and they’ll keep my hands warm. 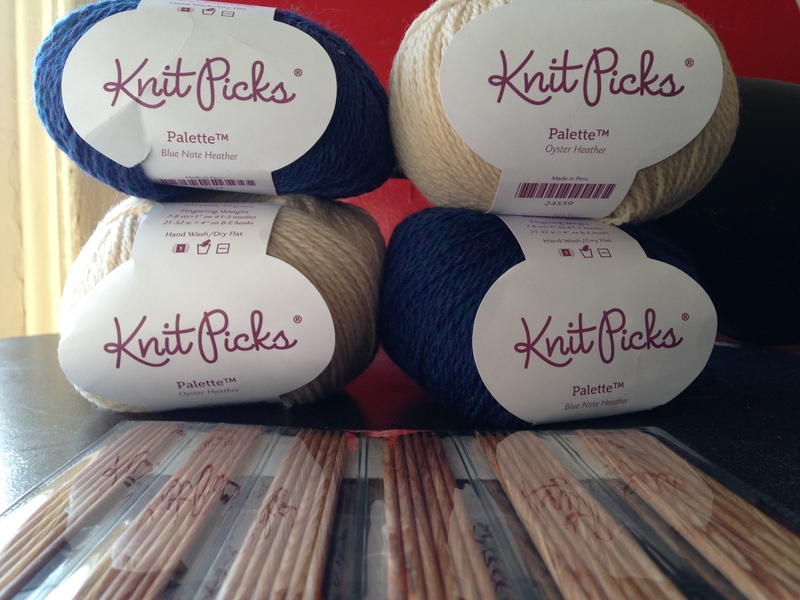 I’ll be using Knit Picks Palette in Oyster Heather and Blue Note Heather. I’m planning to lengthen the cuffs a bit, because I truly detest short mitten cuffs that leave my wrists exposed to the elements. Hoping to cast on tonight! 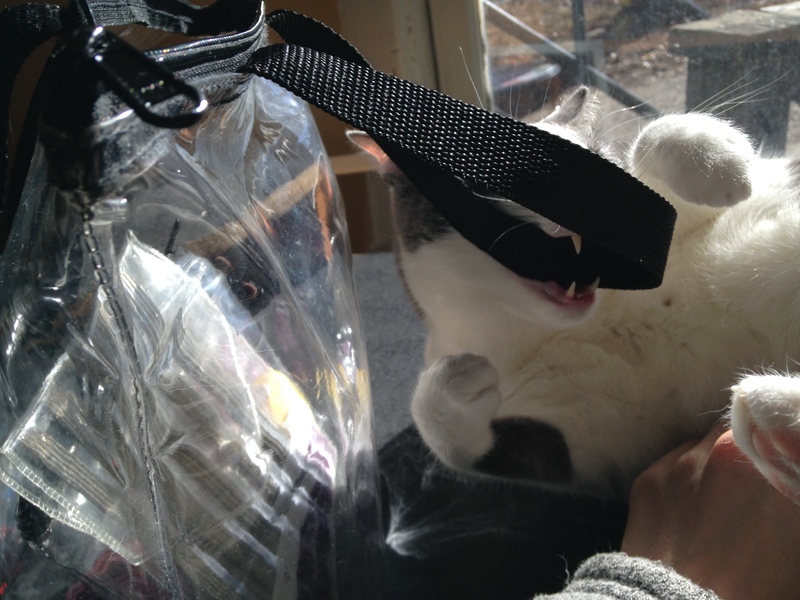 Finally, Jemima was very excited about today’s knitterly photoshoot, and couldn’t wait to get her teeth on some yarn-related items. Look at those teeth! Happy New Year, and happy knitting!!! Finish tatted bookmark: this one I’ve been putting off because I’m still not very confident with my tatting skills, and as such am ver, very slow (and tatting is already a very slow craft). 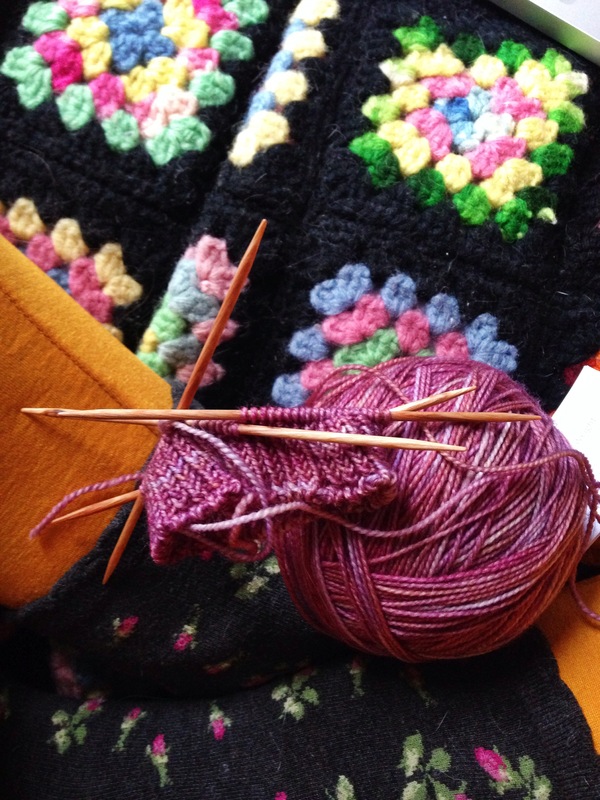 Begin work on the Froot Loop socks: I’m using Knit Picks Hawthorne in the Belmont colorway – all pinks, mauves, peaches, and purples. I’m hoping to get them almost finished before I leave. Apologies for the weirdly pale photo – my phone was struggling with the large amounts of sunlight in the room, and I had to really mess with the brightness and contrast so you could see anything. It’s kind of dreamy looking though; and the dreaminess is maybe appropriate? Because it’s like my dream for the next two weeks, my goal? Or maybe I just haven’t had enough coffee yet today? Anyways, feeling very inspired and dedicated to my knitting at the moment, so I’m hoping I’ll be able to breeze through this list in the next ten days. Happy knitting! 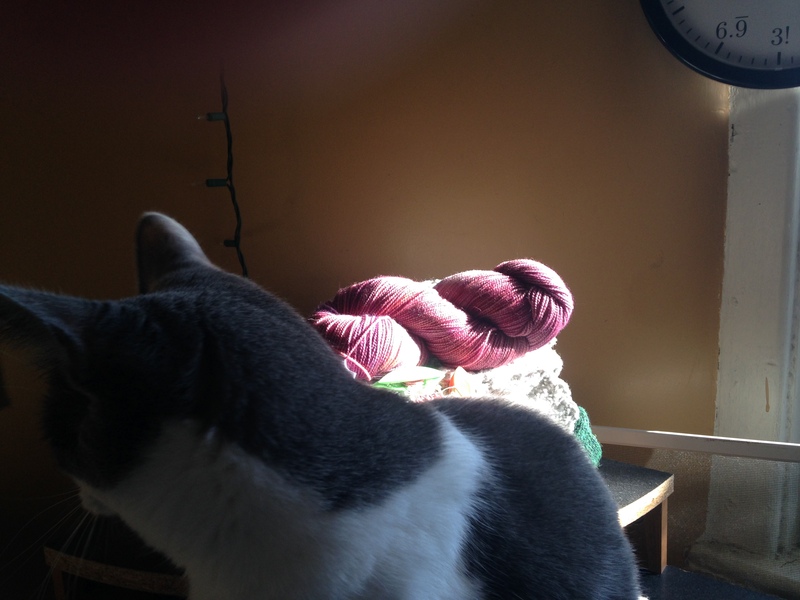 Bonus photo of Jemima trying to intercept the yarn. Annnnddddddd I finished knitting the Campside Shawl this afternoon. All that’s left is to weave in the ends and block. After that, it will be on its way to my cousin in the mail. Successfully turning string into warm clothes feels really, really good. Great way to start the weekend! A couple of weeks ago I stumbled across this blog post. It’s in French, but it shows the charts for this super adorable crochet pattern full of tiny, little cherries. I am a very big fan of cherries, but not so much of crochet, however this post has almost inspired me to give the pattern a try…maybe just a little dishcloth or something. Anyways, it’s bright and cheerful and fruity – the perfect thing for winter crafting. Have any of you seen this pattern before? The chart is posted on Pinterest. Over the past several days I’ve been knitting like crazy, and the Campside Shawl has grown significantly. Here it is trying to be fetching and seasonal on this rainy, grey day. Somewhere in there are a few rows where I apparently lost consciousness and forgot what I was doing, but I’ve decided the mistake is not noticeable (especially in this picture where the mistake is hidden in the curled edges), and I’m pushing forward. I got a second opinion on the matter from my boyfriend and he concurs. 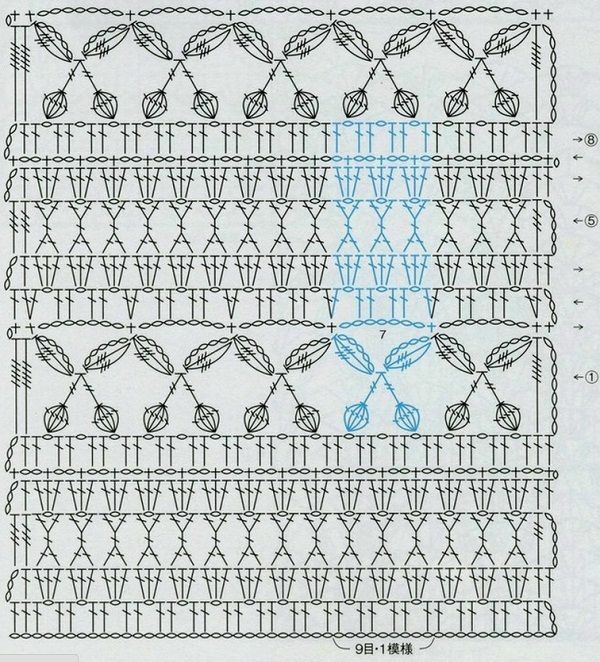 Unless the intended recipient goes over this this with a magnifying glass, the couple of extra yarnover-less rows on the left side will be forever overlooked. 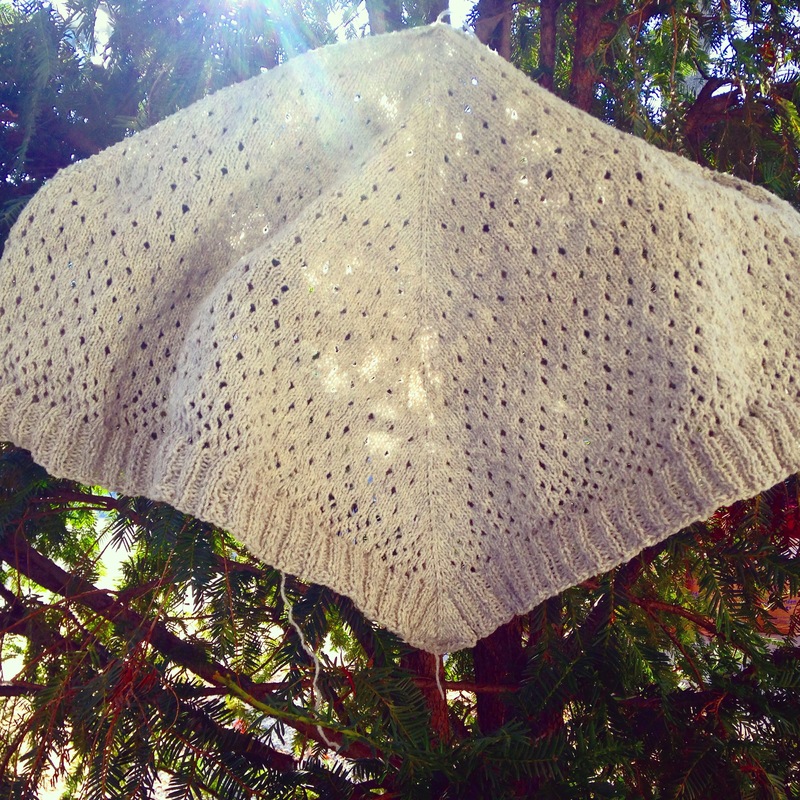 This thing is flying off the needles pretty fast, as the pattern is simple and easy to follow. It’s actually approaching full size, even though I still technically have a couple of charts to get through. I’ll probably cut some of the repeats out and get straight to the ribbed border in a few inches. I don’t want this thing to be enormous. I’ve got some more colorful and exciting knitting planned for the near future, so I’m looking forward to having this done and getting it off to its owner! This week I also spent a couple of hours updating my Ravelry notebook – adding some new yarn and needles to my stash and updating my queue. It was extremely satisfying, and I really can’t wait to cast on some of those queued projects. Hope you’re all having a cozy, knitty December! Oh hello, Blog. Nice to see you again. Yes, I have in fact finished the plain green birthday sweater, first top-down raglan of my knitterly life. The sweater journey that began in Fall of 2013. It is done. Well, almost. I still need to block it. I plan to bring it back to my parents house when I fly home for the holida ys, so between now and then it needs blocking. This will involve clearing off the top of my refrigerator and leaving the cabinet doors open, to prevent the ravenous Yarneater from devouring this deliciously sheepy sweater while it’s drying into shape. It will happen within the next couple of weeks. I really hope that it fits my six-foot tall dad. And I’ve started a new project! 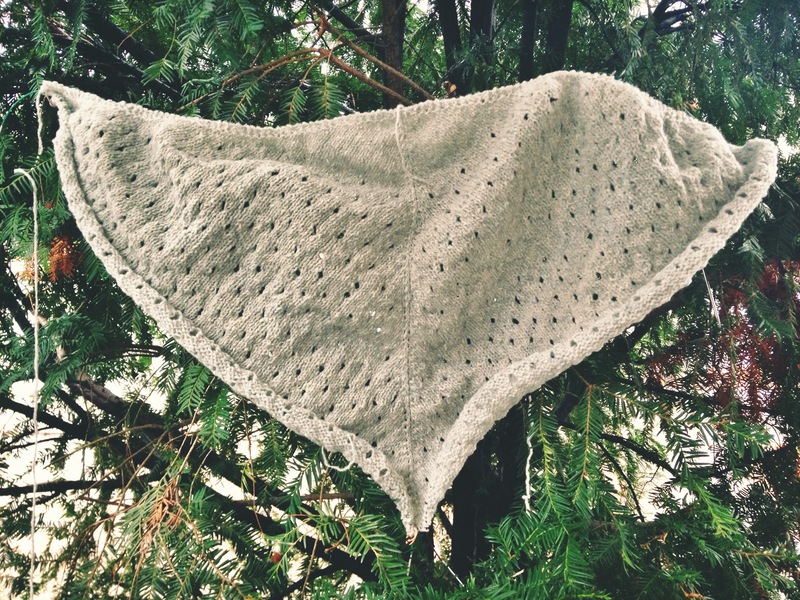 It’s the Campside Shawl, a beautiful triangular shawl designed by Alicia Plummer for the Pom Pom Quarterly blog. It’s simple but lovely, and so far very fun to knit. That yarn is a discontinued Rowan yarn that I bought about six hanks of on sale about seven years ago. I still have plenty of it, but I think this shawl might clean me out. I’m hopeful. Between now and the new year I’d like to finish this shawl and get it off to its intended recipient, finish a small tatting project, and perhaps get in a pair of socks. As always, check out my Ravelry page for more details. Happy knitting! And Jemima says ‘hello,’ as well. I made this little flower key chain yesterday, learning how to make split rings in the process. I’m definitely seeing progress with my tatting skills, though I’m still having issues with tension and ease between rings. 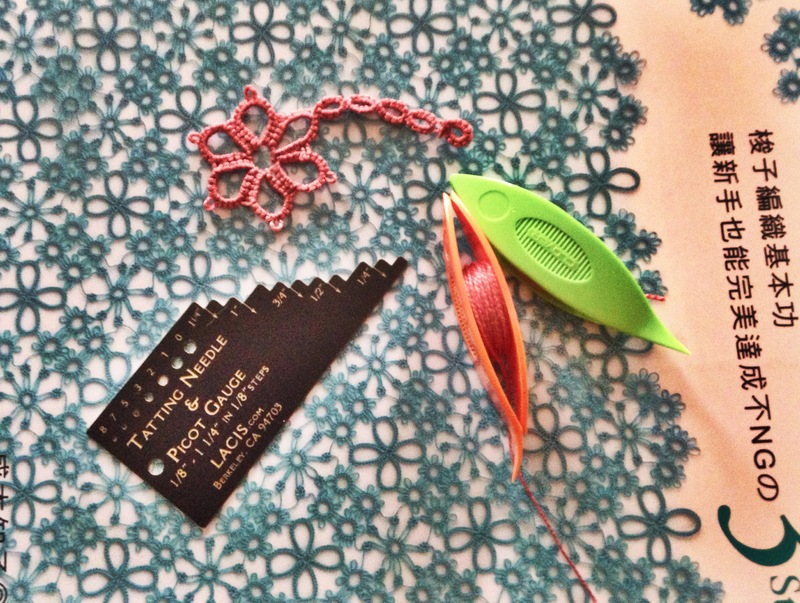 I picked up a picot gauge to help make my tatting look a little tidier. I like it a lot, even though it’s pretty fiddly to try and hold that while trying to make a double stitch. I also picked up some Clover tatting shuttles to try something different from the Aerlit I originally purchased. The Aerlit shuttles have removable bobbins, which is pretty convenient if you want to switch out colors quickly. But I find that they unwind on their own while I’m working so that I constantly have to rewind to get a shorter working thread. The Clover ones have a fixed bobbin, so you have to spin it around occasionally while working to release more thread. I like these much better, I think. The tips are also very pointy and curved, and work really well for loosening stitches to fix mistakes, and pulling thread through picots for joins. The flower itself ended up with six petals rather than the five called for in the pattern. I didn’t leave enough ease between each petal, and I think maybe my picots were too small, and the thing wouldn’t have lain flat with only five petals. It still turned out fine, but it’s something I’ll have to keep in mind if I want to move onto to bigger, more complex projects. I have my eyes on a couple of fancy doilies in the book pictured above – there’s some really beautiful stuff in there. Here’s the link to the Youtube tutorial I used to learn how to do the split rings. It was really helpful and concise. PS. The sweater continues to grow. Crochet friendship bracelets – a free pattern just posted on Pom Pom quarterly’s website. These would make a pretty rad little surprise for a friend, or just for yourself! Also, a great way to flex your rusty crochet muscles (and by “your” I mean “my”). Take a look!